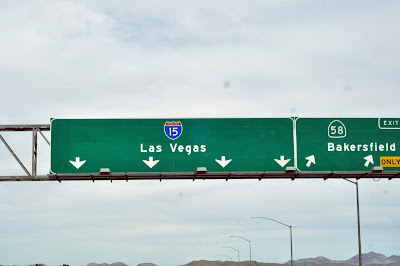 I arrived from a 3 day weekend trip to Las Vegas just a few hours ago. Sounds long but it really was short. 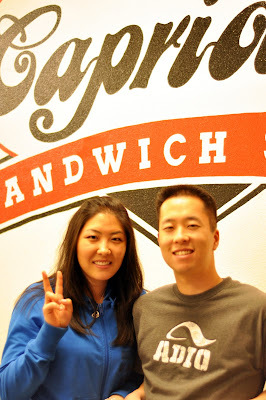 My friend, Jessica, and I left Friday afternoon from Orange County and arrived just in time for dinner. 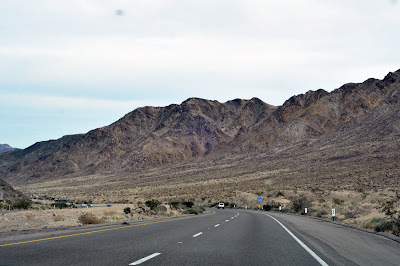 We stayed at her friend's place in Henderson which was about 10-15 minutes away from the bright lights of Vegas. Even before we arrived Jessica enthusiastically would bring up this amazing Thanksgiving Sandwich at this place close to her friend's place. There really was no real debate.. I had to try this sandwich. 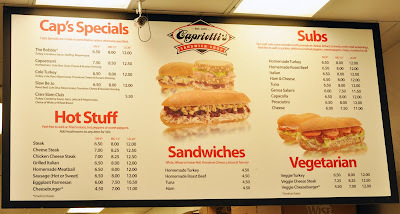 The place is called Capriotti's. The place was very small. No place to sit but a tall bar top to stand and eat. The menu seemed a little generic looking. 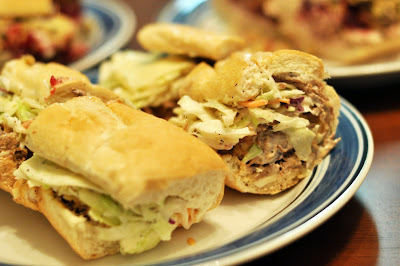 The three of us were hungry so we got one 9" sandwich called a Slaw Be Joe and the 20" Bobbie a.k.a The Thanksgiving Sandwich. We ordered and waited for about 10 minutes or so. Longer than I had expected a sandwich place to take. I took a photo of Jessica and her friend/our host, Mike. 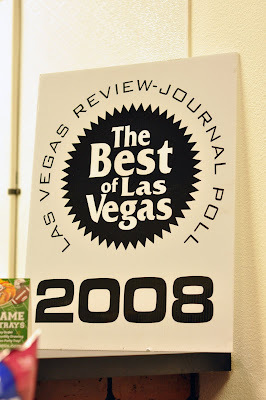 Best of Vegas? Hhmm ok maybe there was some credibility to this place afterall.. We took it back to Mike's place and unwrapped our sandwiches. Alright.. so it was pretty good. 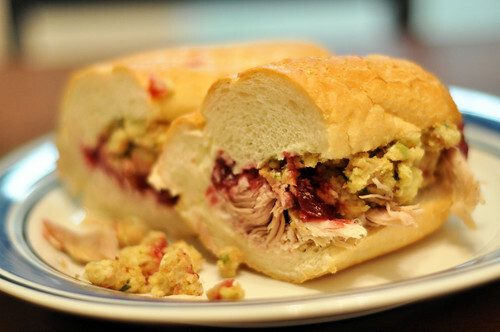 I don't think I've ever had a Thanksgiving Sandwich before. 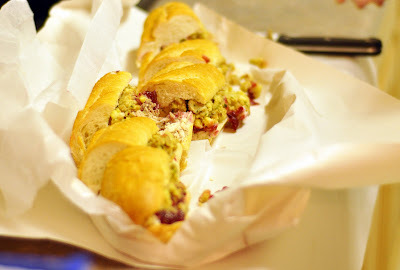 It had turkey, cranberry sauce, and big chunks of moist stuffing. The Slaw Be Joe had cole slaw and thick pieces of roast beef. Pretty good as well. Jessica loves the place so much we ended up going back for lunch today before we headed back to the OC. This time I had the cheese steak.. which, sadly, I didn't take photos of. It was delicious. This is what I get for my laziness. 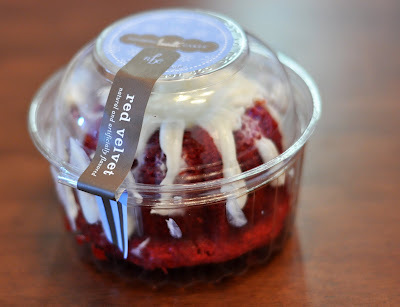 But the funny thing is I had time to take photos of the Red Velvet Bundt cake they were selling. I had eyed them when we were in there the first night but figured it couldn't be very good. After a second time in there.. I had to try it even if it was bad. The packaging was cute. 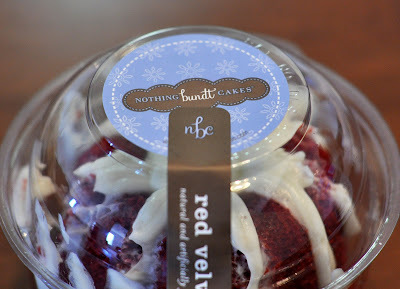 Label of the company, Nothing Bundt Cake, was trendy. How did it taste? As the Yelper's like to say, it was "Meh." It wasn't dry but it wasn't super moist like how I would like my red velvet cakes to be like. And the icing was SUPER sugary and almost grainy. I ate maybe half (it's maybe twice the size of a Sprinkle's Cupcake) and it's sitting in my fridge now. It had chocolate chips in it which made it strange for me. I'll probably finish it tomorrow considering my insatiable sweet tooth. The next day Jessica and I spent all day eating and tasting. Our day started at noon so it actually wasn't the longest day but we did visit a number of places. 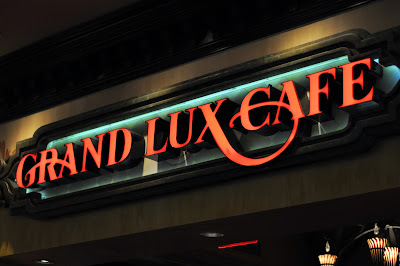 For lunch we ate at the Grand Lux Cafe in the Venetian hotel. When I asked Jessica (who had suggested the place) what kind of food they had here she said that it was similar to Cheesecake Factory. They had a HUGE menu.. yup.. Cheesecake Factory. I stared at the menu for a while then decided to Yelp it and see what people recommended. Before I knew it the waitress was at our table asking if we were ready. 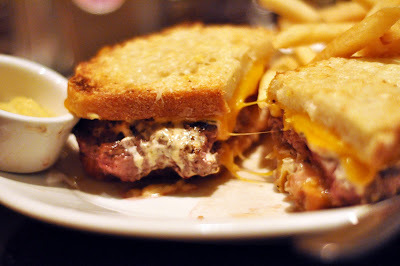 I picked the Grand Lux Burger Melt because it was the last thing I read. I love a good burger but this would have clogged my artery had I finished the whole thing. It was juicy but really greasy. Overall, good! But next time I might go with something a bit lighter. 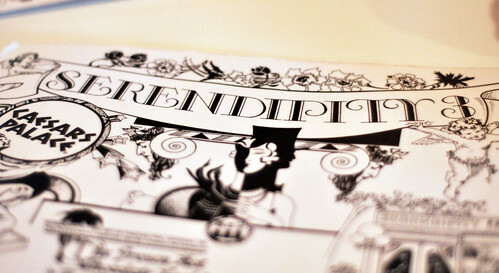 Our next stop was Serendipity 3 at the Caesar's Place. Maybe it's just me but the pink and orange decor was a little tacky to me. I've heard about the one in NY and that place seems more cozy and a hole in the wall kind of place. This one was ostentatious and bright... necessarily bright and pink. Don't get me wrong.. I love pink as much as the next girl but I just didn't get it. 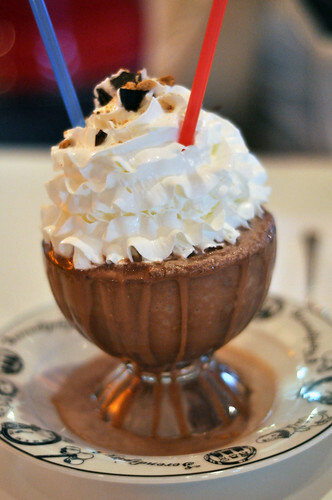 We ordered the Frozen Peanut Butter Hot Chocolate. You can imagine my expectations considering I've heard so much about this legendary drink. This was my first experience and it was good. Not orgasmic... but just a satisfying good. 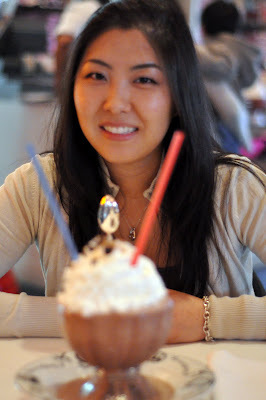 Satisfied my sweet tooth and I will definitely get it again given another opportunity. But the thing with me.. is that I can't have any expectations or it'll ruin it for me. Jessica had a ball. 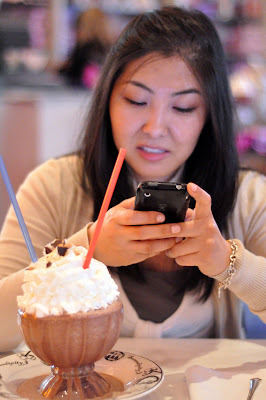 =) She was texting.. taking photos.. and Facebooking all the time capturing this trip. 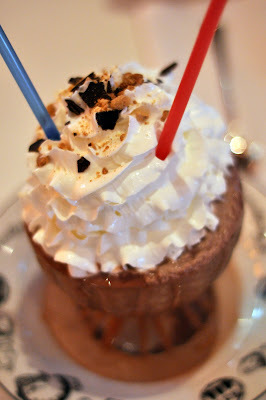 We also visited the Bouchon Bakery and Jean Phillipe Patisserie in the Bellagio, but I took so many photos that it calls for another blog entry altogether.